I recently won a Sakura Pocket Mirror from HomeStudio on the blog, My Organized Chaos. 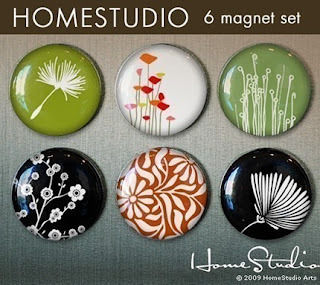 Linda, one of the owners of HomeStudio asked if I would be interested in doing a review of one of their magnet sets and host a giveaway on my blog. I loved the look of their shop and knew it would be something that I would be interested in. HomeStudio makes unique and affordable gifts for any occasion you had in mind and there really is something for everyone. They offer interchangeable scrabble tile pendants in a plethora of designs. There are literally hundreds to choose from in many different categories including Flowers & Plants, Birds & Animals, Words & Symbols, Patterns, Cool, Quirky & Miscellaneous and Holiday Designs. They also offer magnets and mirrors and I was given the chance to check these out for my review. 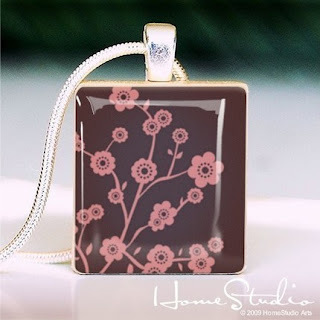 My daughter Stefani and her husband Mark opened their etsy HomeStudio shop about May of last year selling scrabble tile pendants. Her desire in the beginning was to find a way to make some extra money so she could be a stay at home mom. They have been very sucessful as Mark is an artist and Stefani has made and sold jewelry in the past, as well as being very organized, and now devote all their time to their HomeStudio shop. We opened a second etsy shop, HomeStudio2, in late October where I made and sold the magnets and mirrors. Just recently we have combined the two shops into HomeStudio. I still handle the mirrors and magnets. As for my interests, I love my family, especially my four granddaughters. Stefani’s girls, aged 3 and 5, live nearby and love coming to Gramma’s for sleepovers. I am a realtor, very active in my church, love nature, and doing family history – searching out ancestors in our family and helping others find theirs as well. My inspiration is my faith, my gratitude for a very rich and blessed life, and keeping a positive attitude. 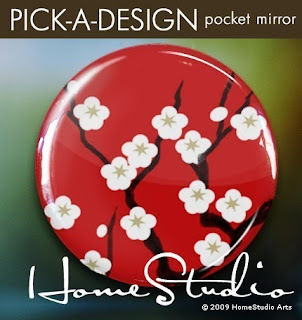 HomeStudio sent me the Red Sakura Pocket Mirror in red (I won this at My Organized Chaos) and the Flowers No. 1 Magnet Set for review. The Pocket Mirror came in a pretty silk bag and is about as big as the palm of my hand so it would easily fit into a small purse. I love how it looks sleek and sophisticated. The Asian inspired Red Sakura design is really pretty too. I think it’s great that HomeStudio offers a variety of designs and that the customer is able to choose from any of the Scrabble Tile designs for their Pocket Mirror. The Pocket Mirror is also very affordable and costs $5.50. I could see myself buying this for stocking stuffer for Christmas or as a wedding shower present for one of my friends. The Flowers No. 1 Magnet Set is impressive and I am LOVE with the Asian motif. I received six magnets in six different themes: Dandelion Fluff, Poppies, Wildflowers, Cherry Blossoms, Saffron Flowers, and Make A Wish. They are one inch in diameter and are hand assembled. I can also say that they are very sturdy and very magnetic! I’ve had many magnets in the past that have lost their “magnetic pull” and won’t hold up jack on the fridge. These ones do and despite being small, they sure do the job (and look pretty too!). These magnet beat the magnets I currently have on my fridge which are those freebies you find in your mailbox from Dentists and Insurance Agents! Now I can proudly display my kid’s artwork with these cute little magnets. The magnets can be purchased for $8.95 which is a fair price considering the quality and workmanship you can tell went into their creation. I recommend HomeStudio and love their creations!